As you’ve might have heard, we’ve gotten Zef into daycare a few days a week. I’ll probably write a future post about daycare options in Paris, but not now. Right now I want to talk about what Zef and I are going to do when I still have him all day long and his mom is trudging through the ol’ nine-to-five. See, Wednesdays I still get to zip around with Zef all day. Some days we go to the grocery store, get the shopping done and pick up around the house. However, much to the chagrin of my wife, these sorts of days are fewer and further between than they probably should be. Instead of our chores, we have been on the lookout for things to do to sort of spice up the week. Mombini, one of the really nice baby-friendly cafés around Paris, is fantastic, but it got a little stale after the 11th or 12th time (admittedly, for me and not for Zef… he still loves slobbering over every little toy they have there). And the other week we went to the Musée de l’Orangerie, which was awesome, but you can’t go to a museum every week, can you? This week, we found something a bit more interactive at Shakespeare and Company, that famous, quirky little indie bookshop just across the Seine from the Notre Dame. Kate Stables, the British folk-rock musician of This is the Kit, runs a Children’s Hour pretty much every Wednesday at 3pm. On the event page, it states that this hour includes: “music, rhythm, and stories for kids,” and goes on to specify that these kids should be “2-6 years old.” Kate asks that you send her an email to make sure there is space at least a couple of days before you attend. I thought I’d ask her if it was okay if there was space for an almost-12 month old who really seems to like music and stories. “Under twos are of course totally welcome!” she wrote back to me just a few short hours later. Great news! Zef and I packed up, bundled up (Paris is damn cold right now) and caught the Metro to Saint Michel. 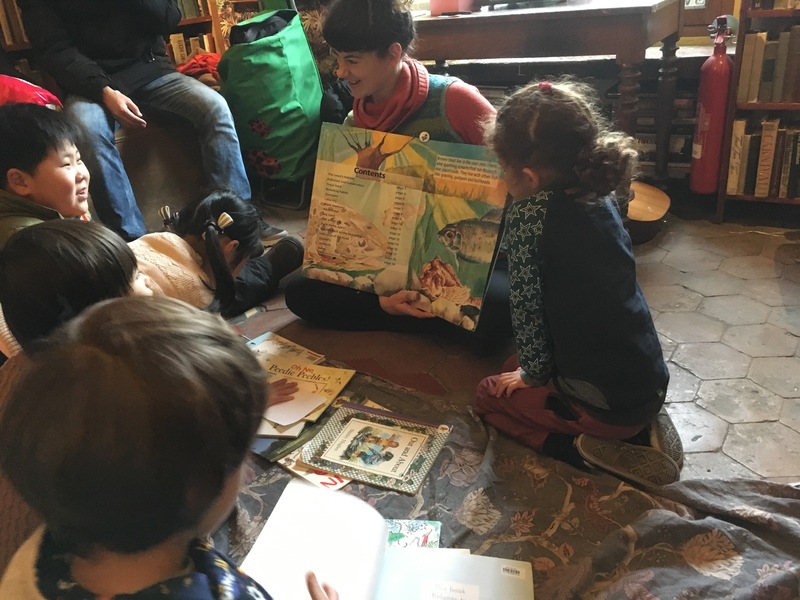 We didn’t know exactly what to expect, but we were thrilled when other parents with their kids (all clearly on the higher end of the above-mentioned 2-6 year-old bracket) joined us with Kate to read stories and sing songs. How the Children’s Hour works is pretty simple. There is a lot of kid lit spread out on the floor. The kids take turns picking stories and, after a few stories, it is time for music. For the music, each kid gets an accompanying percussive instrument or instructions for physical movement during the song, like in “Head, Shoulders, Knees and Toes.” All of this, it goes without saying, is way beyond the intellectual grasp of Zef as he hasn’t quite mastered all of his body parts or the concept of rhythm yet. I should note that Kate is terribly kind. As she led the group in a round of “She’ll Be Coming ‘Round the Mountain,” Zef was crawling all over her and her guitar. She laughed it off, continued playing and entertained his intermittent shrieks of excitement, which came often and at seemingly always at the wrong time. Needless to say, he’s probably the worst audience she’s ever had. While the other kids scowled at Zef’s misbehavior, however, their parents flashed smiles of knowingness and had seemed to have a good time, encouraging their kids to share the percussive instruments (maracas, tambourines, bells, that sort of thing) that magically appeared from a box Kate kept hidden behind herself and Zef so badly wanted to take from them. Side note: Almost nothing makes you feel more self-conscious as a parent than when your kid is misbehaving around other parents, even if that kid hasn’t even reached his first birthday. I had to hold myself back from apologizing to the Moms and Dads every time Zef screamed or pulled on the shirt of another (much older) kid. Instead, I contented myself with shamed nods of the head and apologetic wincing. I hope they understood. Zef is almost one year old now and he is still struggling with the concept of sharing. He loves to give away almost anything in his hand, but he does expect something else in return. 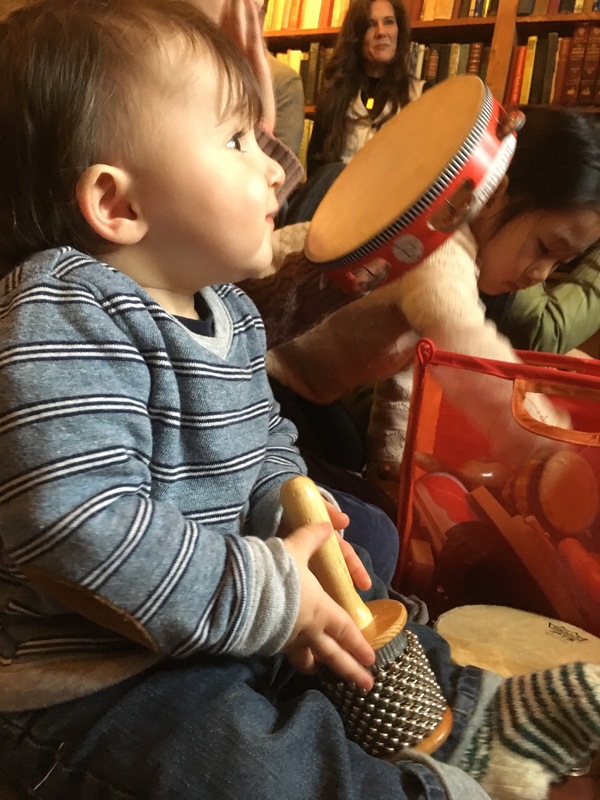 It was clear that sharing was something that many of the other kids, likely in Kindergarten or 1st grade, obviously still struggled with as there were pouty faces every time Mom or Dad asked little Inigo or Aiden to share the bell or the tambourine. We parents managed to put out these little pout-faced fires with a lot of help from Kate, who was quick with suggestions to the kids for new instruments, new songs, and new stories. In short, the Children’s Hour with Kate Stables is a winner. We’ll be back soon. You can find Kate Stables and This Is The Kit on Bandcamp, listen to them on YouTube, check out their super fun music video for “Magic Spell”, find them on Facebook or download their music on iTunes. Shakespeare and Company is on 37 rue de Bûcherie, just across the bridge from the Notre Dame cathedral in the 5th arrondissement. If you’ve never been, you should probably go sometime, either for one of their fabulous events or just to stop in, grab a book and take a look around. Beware of high tourist season, though. There is sometimes a line to get in and the bookstore can get over-crowded, which can make book browsing around a pain. The Children’s Hour, like most of the events at Shakespeare and Company, is in the library upstairs. The event is free, though a 5 euro donation is appreciated. See the Shakespeare and Company event page for more details. Art Anxiety: Taking Zef to the Museum!